You can listen to a podcast review of A LITTLE CHAOS here or by subscribing to Bina007 Movie Reviews in iTunes. A LITTLE CHAOS is a charming amuse-bouche - a witty historical fantasy - gently telling us much about the perils of court life. It stars Kate Winslet as a gardener, Madame Sabine de Barra, in the court of Louis XIV. We watch her charm Power by speaking Truth, triumph over court intrigue and create a little chaos in the carefully ordered gardens of the newly built Versailles. In all this she is aided by her frank and simple manner and the kindness of many aristos - not least the King’s brother and sister-n-law - a delightfully flamboyant and honestly dutiful couple played by Stanley Tucci and Paula Paul. Sabine also falls for the married Master of the gardens, André Le Nôtre (Matthias Schoenaerts), who throws off a typically cynical court marriage to pursue the affair. And what of the king himself? 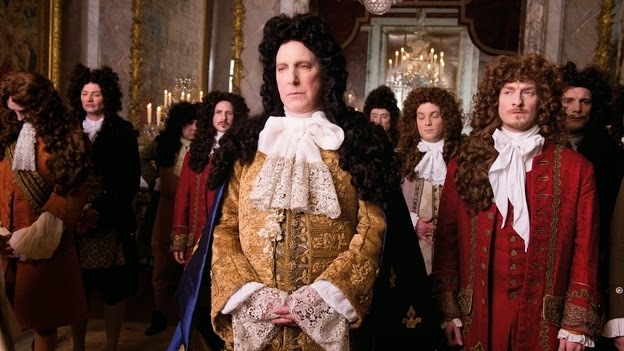 Alan Rickman plays Louis XIV as weary, conservative but willing to listen in a handful of charming cameo scenes. The movie is so very dripping in charm and liveability that it’s easy to forget that the basic concept of a gauche outsider finding favour in surprising circumstances in lifted from many a genre movie. Alan Rickman’s direction is stylish, elegant and all elements combine so gracefully that it may seem a more frivolous thing than it really is. For behind the sumptuous clothes and reawakening of life are a handful of delicately played scenes about the reality of court life - trapped, bending to the will of the king, discarded as beauty fades, and unable to show public grief. I think the approach Rickman takes is superbly judged and best summed up in a brief scene where Sabine meets the discarded King’s mistress (Jennifer Ehle). It’s not the grandstanding scene with the king that I like, but rather the one that precedes it - as women of all ages meet in secret intimacy to discuss their figures, their loves and their children. Praise then to Rickman, his cast and perhaps particularly to debut screenwriter Alison Deegan for giving herself the license to go off-piste with history. My only criticism, if criticism there must be, is that I was rather disappointed with just how formal and hard Sabine’s garden was. After all, having spent the opening scenes in debate with Le Nôtre about formalism vs organic beauty it might’ve been nice to see something of that in her final creation. A LITTLE CHAOS has a running time of 116 minutes. The movie played Toronto and London 2014 and will be released in the UK on February 6th and in Portugal on March 5th.